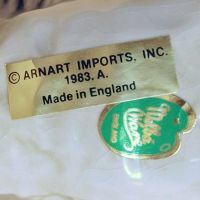 Seeing the vast number of items with Arnart marks and stickers, many people incorrectly believe that this company was a manufacturer. But they merely imported customized products, mainly via their US office located at 212 5th Avenue. 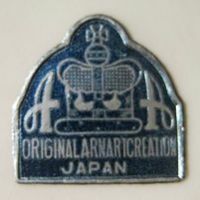 An interesting fact in this context is that even after the 'Arnart 5th Ave.' mark had been introduced in 1957, Arnart actually continued to use the 'Arnart Creations Japan' stickers. During the mid-50's the company decided to present an own series of figurines; this decision was based on the popularity of the Hummel figurines produced by the German Goebel company. 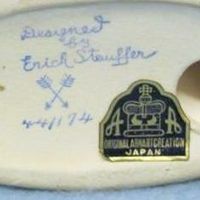 Arnart therefore employed the US designer Erich Stauffer and many urban legends rank around both the person as well as his items. 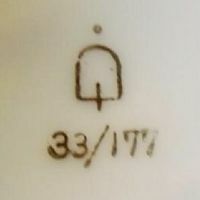 For example, some people claim that the goods designed by Erich Stauffer were made by the Kalk company from the town of Eisenberg in Thuringia. Which is total nonsense, just like the legend that Stauffer actually worked for the Goebel company or -in another version of the legend- was the designer that created the famous Hummel figurines. 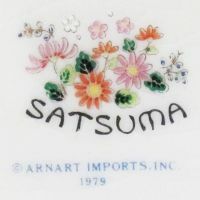 As said, most items were made in Japan, and Arnart Creations eventually was renamed into Arnart Imports, Inc.. Small numbers of items were by then imported from manufacturers in England as well as Germany, but following the successful decades in business based on items made in Japan, the market eventually shifted. 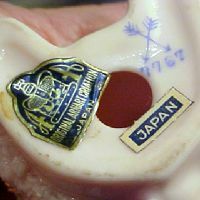 As direct result, the largest part of the product range was later produced in Taiwan. In the year 2001 the business is claimed to have moved to 230 Fifth Avenue (Suite 2004). 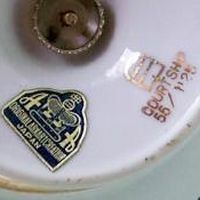 Fact is that the company in 2001 discontinued many old marks and dropped various registrations. When checking out marks on items without stickers, take a look at the number of feathers on the arrows and the numbers included in the mark. 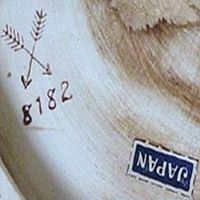 Certain combinations of numbers and three feathers mostly indicate production for Arnart while other number sets and four feathers often indicate manufacture for ⇒Home Interiors & Gifts (HomCo). That is of course not set in stone but certainly a good start for further research. 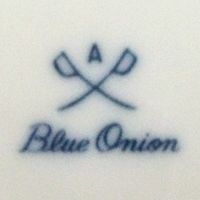 The three-feathered arrows with additions like "Blue Onion", "Brown Onion" and "Grenada" were normally reserved for kitchenware items and utensils whereas the latter name is often missed as it was apparently only used on a single series of square canister sets. 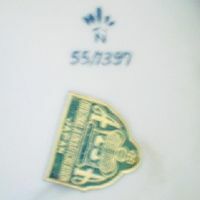 Closeup of the well-known sticker. The trademark was registered on April 30th 1953 and cancelled February 17th 2001. Another sticker closeup, note that it reads 'GERMANY'. 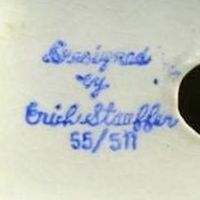 This was only used 1956 on ceramics made by the Scheurich company. Crossed arrows with three feathers above a four-digit number. 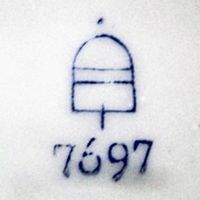 Crossed arrows with three feathers above a four-digit number trailed by a 'P'. Many four-feathered versions were produced for ⇒HomCo but Arnart also had its fair share, like here on item '7419'. ... marks on items designed by Erich Stauffer (which also carry a leading 'S'), here with three feathers. ... as can be seen on this, also four-feathered, version. 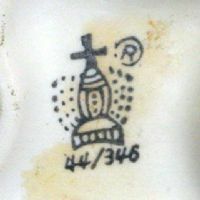 This five-feathered mark was found near an impressed 'DESIGNED BY ERICH STAUFFER'. 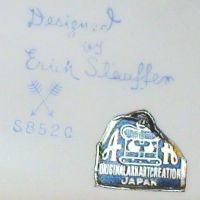 Other Stauffer designs have no crossed arrows at all. 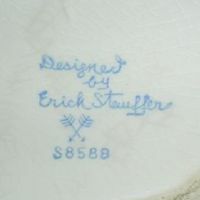 Finally, a 'DESIGNED BY ERICH STAUFFER' on an item from the newer 'MILK WHITE' series. 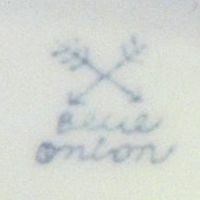 Arnart version of a 'BLUE ONION' mark. 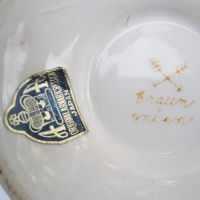 The brown edition was (peculiar enough) written as 'BRAUN ONION' (German). 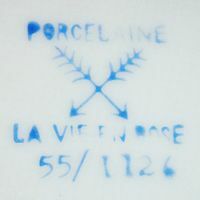 Crossed arrows were also used for the 'PORCELAINE' series, items of French-inspired design or depicting French scenes. Same as before, but with early 'ARNART 5TH AVE.' addition. 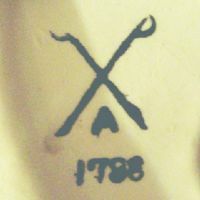 Crossed swords above a single 'A' and the item number '1788'. 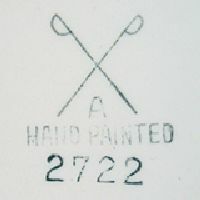 Crossed swords above a single 'A', 'HAND PAINTED' and the item number '2722'. 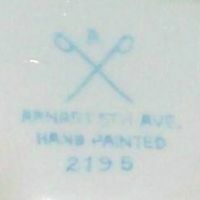 Single 'A' above a set of crossed swords, that above 'ARNART 5TH AVE.' and 'HAND PAINTED' and the item number '2195'. 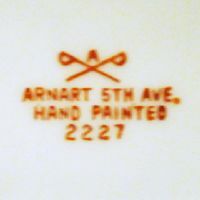 Single 'A' above a set of crossed swords, that above 'ARNART 5TH AVE.' and 'HAND PAINTED' and the item number '2227'. 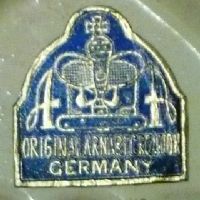 A single 'A' above a set of crossed swords above 'BLUE ONION', found on an item with Arnart sticker. 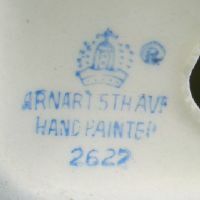 This is the basic 'ARNART 5TH AVE.' mark registered 1957. 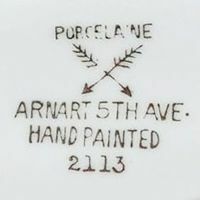 'ARNART 5TH AVE.' mark in the 'ROYAL CHINTZ' version. 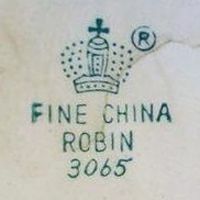 Original 'ROYAL CROWN' mark, here on the bird figure 'ROBIN'. 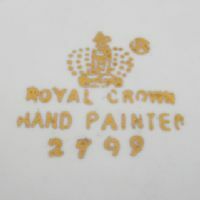 Here the better known version with crown above 'ROYAL CROWN' and 'HAND PAINTED'. 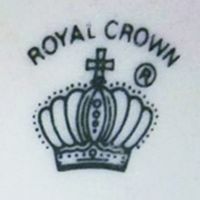 Elaborate 'ROYAL CROWN' mark from 1984, here on an item produced in Taiwan. 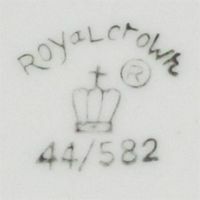 Simple 'ROYAL CROWN' mark from the 1980's. 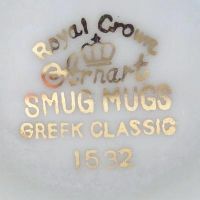 Simple 'ROYAL CROWN' mark, here on the 'SMUG MUGS' edition 'GREEK CLASSICS'. 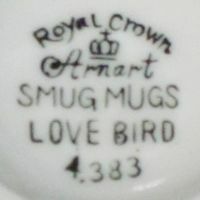 Simple 'ROYAL CROWN' mark, here on the 'SMUG MUGS' edition 'LOVE BIRD'. 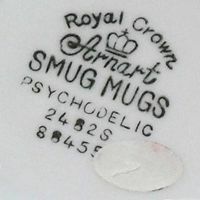 Simple 'ROYAL CROWN' mark, here on the 'SMUG MUGS' edition 'PSYCHODELIC'. Note the extended item numbers. 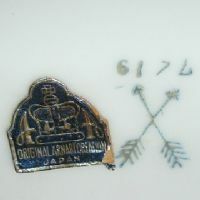 Arnart also had special marks for some series, here the 'SATSUMA' version. 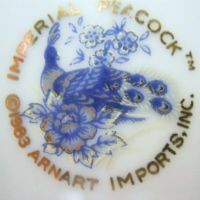 Mark of the 'IMPERIAL PEACOCK' series. 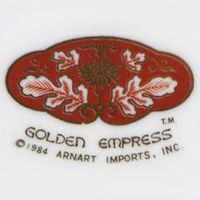 Mark of the 'GOLDEN EMPRESS' series. Sticker from 1983, here on 'MELBA WARE' from England. 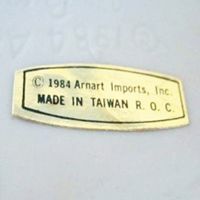 Sticker from 1984, here on an item made in Taiwan. 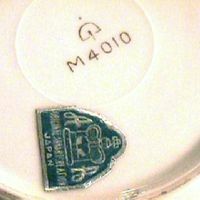 Another 'mini-beehive' in gold, here on item number 'M4010', with Arnart sticker. Another version, here in red on item number 'M4036'. 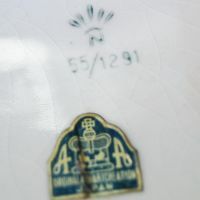 A 'mini-beehive' in gold, here on item number '33/177'. 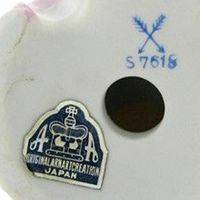 Arnart 'beehive' mark (example on item '7697'), registered in Japan in December 1957 and cancelled February 17th 2001. 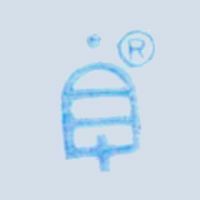 A few versions of the Arnart 'beehive' mark included the small circled 'R' for 'REGISTERED TRADEMARK'. 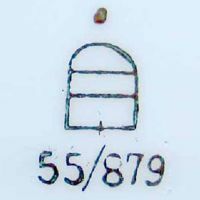 Arnart 'beehive' mark, here on item '33/775'. 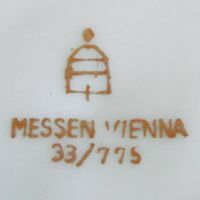 The 'MESSEN VIENNA' addition is nonsense. 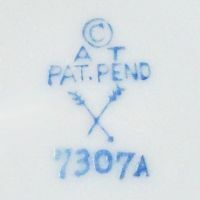 Arnart 'beehive' mark, here on item '55/879'. 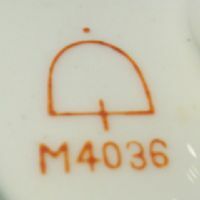 Arnart 'beehive' mark, here on item '55/1125' which was titled 'COURTSHIP'. 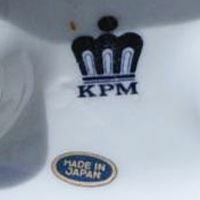 Arnart 'K.P.M.' mark, even Roentgen incorrectly lists this as German. 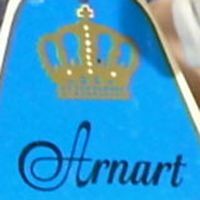 Arnart 'K.P.M.' mark, here with 'MADE IN JAPAN' sticker. 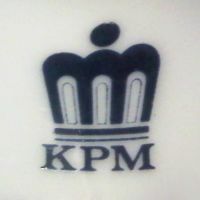 A version of the 'Royal Crown' mark as it can be found on cardboard tags accompaning the 'KPM' marked items. 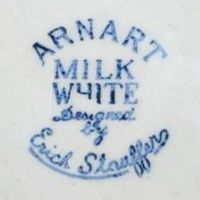 Claimed to be an Arnart mark, the '© A T' is claimed to stand for 'Arnart Trading'. 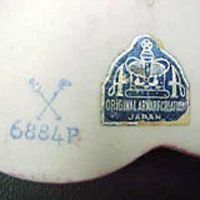 Arnart's own version of the 'crowned N' mark, here on item '55/1291'. 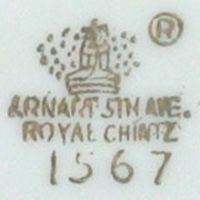 Arnart's own version of the 'crowned N' mark, here on item '55/1397'.